Cream Puffs are notoriously Choux Pastry filled with cream, although it's quite common to find them filled with Custard (Custard Puffs?). For the sake of this recipe, I will just go down the Cream Puff track (but you are free to fill your Cream Puffs with anything at all - even jam or Cream Cheese if that is your preference). Put the choux paste into a forcing bag fitted with a plain 1/2 inch nozzle. Grease a baking tray and flour it lightly. Holding the forcing pipe at right angles to the tray, pipe the paste into small, even-sized rounds, spaced well apart on the tray. Bake in a moderately hot oven (220°C) for about 30-40 minutes, until well risen and golden brown. 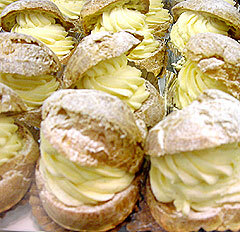 It is essential that cream puffs, like all confections made from choux pastry, should be thoroughly cooked and dried out before being removed from the oven. When they are baked, split each bun towards the bottom, to allow the steam to escape, and put on a wire tray to cool. Fill with whipped cream, mock cream, butter cream or custard - and sprinkle with icing sugar.